When writer Katherine Steward discovered that a program called “Good News Club” was announced as an after-school activity at her daughter’s public school, she decided to investigate further. The result was basically her book The Good News Club: The Christian Right’s Stealth Assault on America’s Children. What she discovered was that the after school club was actually more than just a club that met after school; it was an attempt by an evangelical Christian organization to proselytize in public schools. According to Stewart, the Good News Clubs advertizes themselves as “Bible study” clubs that are only focused on those students whose parents give permission for their children to participate. But in practice, according to Stewart, those who run these clubs use tactics to try to coerce and cajole other children to participate, even if those children’s families are of other religious persuasions. Stewart also points out that these clubs are more about instilling a fundamentalist religious doctrine in kids who participate than trying to simply study the Bible. In her book, Stewart traces the Good News Clubs all the way back to an organization called Child Evangelism Fellowship, which is a global organization who does nothing to mask its intentions. Its intentions are clear if you look at their web site. “Child Evangelism Fellowship is a Bible-centered organization composed of born-again believers whose purpose is to evangelize boys and girls with the gospel of the Lord Jesus Christ and to establish (disciple) them in the word of God in a local church for Christian living.” Through their Good News Clubs their goals are to teach and indoctrinate children in a fundamentalist Christian worldview and make sure children attend Christian churches who subscribe to that fundamentalist world-view. Throughout her book, Stewart takes readers through the various tactics that those who lead these Good News Clubs utilize to indoctrinate and lure children to this fundamentalist worldview. She actually attends conferences and training to get a complete view about what these clubs are really about. In the end, her verdict is that these clubs are more about trying to proselytize in public schools and undermine public education than offering after school options to parents. Perhaps someone who buys into the fundamentalist Christian perspective would find Stewart’s book offensive. After all, if you believe your worldview is the one all people should have, then whatever tactics used to disseminate that view to others is acceptable, even directed toward little children. But Stewart’s book should provide enough reason to pause, for school leaders, before allowing these kinds of clubs to move into school settings. We as school leaders in the United States also serve a broader public whose beliefs do not always fall in line with a fundamentalist Christian worldview. Our students represent many faiths, and, while clubs like the Good News Club might serve some of our students, we must not forget that there is diversity in our schools. In this sense, we become the guardians of tolerance. Stewart’s book is an excellent read in that sense. School leaders facing a decision on whether to allow Good News Clubs in their schools would do well to read this book first. Since purchasing a MacBook Pro last weekend, I’ve been exploring RSS Feed Reader programs. Of course there’s the web-based stand-by programs such as Feedly or NewsBlur which I’ve written about before. But somehow, since the demise of Google Reader, I’ve been using either one of these, and I haven’t been entirely pleased with the experience of these two reader options. Both seemed to be plagued by bugs and misfires, at least in my experience, so while using Windows, I used them because there just didn’t seem to be a great deal of options. Since becoming a Mac user, I have been trying some RSS feed readers, and in ReadKit, I think I’ve found a solid reader that has a clear interface as well as the ability to share articles directly from the reader to a number of other web services. The program allows users to share to the usual social media outlets such as Twitter or Facebook, as well as sharing to other collection apps such as Pocket or Instapaper. Users can also customize the interface to their own needs like most other Feed readers, and they can also use their usually RSS feed services such as Feedly, Fever, NewsBlur, Feed Wrangler and Feed and Feedbin. While most other Readers provide all of these features, for the most part, ReadKit has proven to reliable and less buggy than other readers I’ve tried, and it has a well-laid out interface with easy to learn features. Currently, ReadKit is on sale for $4.99 in the App Store. 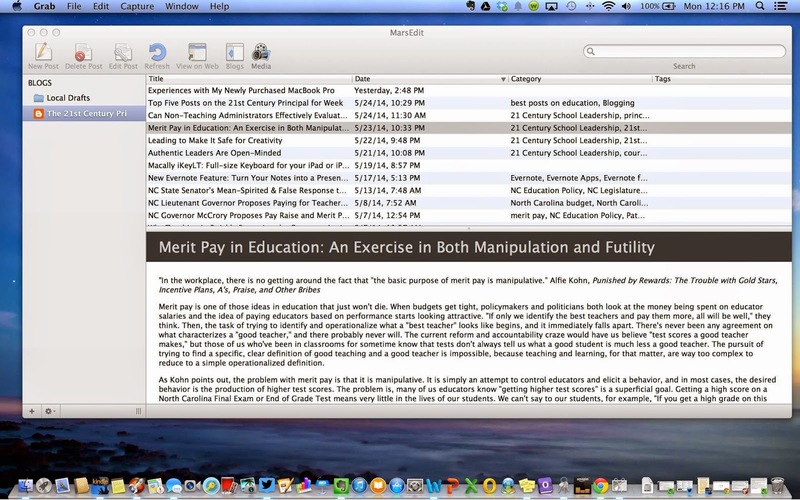 It is an excellent Feed Reader for Mac Users. Perhaps we should run an ad in Houston, but it wouldn’t look like this one. Here’s what our ad might look like. As long as our North Carolina Legislature is more interested in tax cuts for the wealthiest and for businesses, than providing a quality education, unfortunately this won’t change, but with the way our state government is acting, one has to wonder whether that is their intention. Administrator salaries have been separated from the teacher salary schedules and no change from last years salaries. Personnel on these schedules would receive an average 2 percent pay raise. Teachers would get 11% pay raise if they choose to give up tenure. Central office employees would receive a $500 raise while the rest of state workers would receive $800. Teacher assistant funding would be cut in half. No improvement in instructional supplies funding and technology. State funding to local central offices would be cut by 5%. Reduced funding to school transportation by $28.6 million. Funds replaced with driver’s education funding which would be cut entirely. The North Carolina Department of Public Instruction would be cut by 30%. Grades 2 and 3 teacher allotments will remain at 1 teacher per 18 students rather than be reduced to 1:17 as funded last year. As Dr. Atkinson amply points out, “The dismal state of textbook, technology, and instructional supplies funding means that teachers will have fewer resources to work with as they develop lessons and assignments,” this lack of additional instructional resources continues even as accountability and testing demands have increased. These cut resources will also translate into teachers having to take on even more responsibilities and duties in the schools as well. Teachers will most likely in their dedication do what they normally do, continue to dig deeper into their own pockets for money to pay for what this state legislature is refusing to pay for. It would appear that our North Carolina Legislature and Governor are continuing the same strategies and plans that had from last year. They will do all they can to make sure business and industry get those tax cuts as evidenced by their proposals now to limit taxing from local governments. Education is simple dispensable with these politicians. That leaves these questions to think about? Why would any business or industry be willing to move to North Carolina with such anti-public education leadership in the state government—from Governor McCrory, to Senate leader Phil Berger, to House leader Thom Tillis. All that talk about preparing students for careers and jobs seems to be bluster. These people aren’t willing to work with educators. They are focused intently on an agenda that must have been borrowed from the American Legislative Exchange Council or ALEC. How can our state government leaders possibly think this budget would be good for public education in this state? This budget will do more to set education back in North Carolina than anything else this state legislature has done. One can almost conclude that is their intention; wreck public education in this state. 1) Teachers must give up their tenure voluntarily. 2) Teachers in the lower grades must give up having teacher assistants in their classrooms. It’s clear our legislature is on a mission to get rid of tenure, and they will do anything they can, including using bribery in the form of pay raises teachers deserve. The level deviousness and subterfuge Senator Phil Berger and Senator Jerry Tillman and the North Carolina State Senate resort to in this matter literally leaves one tongue-tied. There are simply finding a “backdoor” way to continue their destruction of public education. One can almost picture ALEC (American Legislative Exchange Council) standing over their shoulder, leaning down and whispering these schemes to them. In their budget plan, they trade teacher assistant jobs for the pay raises, thereby putting even more people out of work and making the work of lower grade teachers even more difficult after budget cuts the previous year forced most districts to increase class sizes. Here’s some of the other cuts in this NC State Senate budget that seem to show that our North Carolina Legislature is still on a path to dismantling public education is this state. In 2015 all drivers education funding in the state will be cut. NC Department of Public Instruction would see a 30% cut. Funding for buses and transportation would be cut in another bill. When it comes to public education, I’ve grown to be surprised very little with what Senator’s Phil Berger and Jerry Tillman do when it comes to public education. They simply do not see it as important, why else would they be doing what they’re doing? What surprises me more? There still seems to be so little protest from other educators. Perhaps that’s because most of them have already left the state. Perhaps the Houston School District want to run that advertisement again. I am sure there might be more takers this time. This keeps up, Berger and Tillman will have closed down public education in this state and all our educators will have moved to Houston. (See “Houston School District Lures Teachers with Job Fair." See these WRAL articles for full details on these stories. “Senate Leaders Defend Education Cuts"
“Senate Budget Funds Teacher Salaries Through Other Ed Cuts"
“NC Bill Would Cut Funds for School Buses"
Recently, I received an anonymous comment on my blog post entitled “Merit Pay in Education: An Exercise Manipulation and Futility.” I have purposefully chosen to not publish anonymous comments on this blog because I believe firmly that if you have something to say, then you should be willing to divulge your identity. Part of your message is who you are, and hiding your identity is actually hiding part of your message. At any rate, the commenter who calls him or herself “Engaged Parent” seemed to practically dare me to publish his or her comment. I won’t publish it as a comment, but I will share it here with my own commentary because there are some fundamental misconceptions apparent in that comment. Here’s “Engaged Parent’s” comment, then I will respond. Even though you're going to NOT publish this comment I think it's worth sending it to you anyway. A teacher you are yes? I'm going to assume that. Over and over again I see the same comments on how we can measure the success of education. It's great that we keep hearing how a merit program doesn't work but what's the alternative? It would be nice (for once) to hear a teacher tell us how a "bad" teacher can get filtered out of the system. I'm sure you will agree that not all teachers are good, there are always some bad apples in the bushel, no way around it. I agree, test scores are not always a good judge of how a teacher is doing but it does or it at least should give key indicators to a teacher that maybe what they're doing isn't the best for that particular mix of kids and that another approach might work better. But do they do that? I don't know. Why are teachers the only ones who don't have to be put under the scrutiny of evaluation? The rest of the world has to go through it. What I really want to say is I think that a happy medium could be met if careful thought was put in to it. 10 % what did your students think of you? 15% what did your students parents think of you? 25% principal scoresIs that not a fair assessment? If not then come up with SOMETHING because personally I'm sick of hearing how teachers don't want to be assessed. 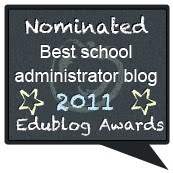 First of all, let me say that yes, I am a teacher, and I don’t think I’ve hidden that fact anywhere on this blog. You can find that information on the blog sidebar. I am currently a principal. As a teacher though, I am more concerned with your logic and misconceptions in your comment than anything else. First of all, you seem to suggest that merit pay should be implemented because we have no alternatives. Following this argument means that the rationale for implementing merit pay lies, not in whether it will work or not, but because we don’t have any other alternatives. That in itself is faulty reasoning. I certainly hope my physician doesn’t implement a treatment or my mechanic doesn’t simply initiate a car repair because he or she says, “What’s the alternative?” without considering the evidence of symptoms and lab test results that identify the problem. You are hearing criticisms of performance pay because it has been researched and has failed to bring about the improvements sought, which is increased student learning. It has been tried in public education, even in North Carolina with no appreciable effect on the quality of education. You next assertion seems to be thinly veiled when you state “It would be nice (for once) to hear a teacher tell us how a “bad” teacher can get filtered out of the system.” It appears you have a belief that “bad” teachers never get dismissed. I would agree with you that not all teachers are good, which I gather you really mean effective at helping students learn among the many other things teachers do. But contrary to your belief, they do “get filtered” out of the system, at least in my experience. So your belief that teachers who don’t do their jobs very good somehow are not subject to dismissal is another misconception. Teachers can be dismissed fairly but with “due process,” which means that I as an administrator must thoroughly document my rationale for doing so. Many administrators see “due process” or tenure as many call it, as an obstacle, but due process rights were put in place because historically, our education system was notorious for political firings and reprimands. Teaching historically has been quite political with school board members or even administrators firing teachers for noxious reasons. Teachers have been fired for being pregnant or even so a school board member can then hire a son or nephew. At any rate, it is a misconception that teachers who aren’t doing their jobs can’t be fired. It simply takes leadership and willingness to first try to help that teacher improve, then take the steps necessary to counsel them into another profession. Still another misconception from you comment is that teachers aren’t under the “scrutiny of evaluations.” I have been an educator in North Carolina for 25 years, and I have always been subject to evaluations, so the idea that teachers aren’t somehow evaluated just isn’t true. Teachers in my state have been evaluated for years, and some are dismissed as a result of those evaluations. When you hear all the criticism of current evaluations systems, those do not come from the desire to avoid evaluations; it comes from the desire to have those evaluations be fair. You yourself acknowledge that test scores alone are not always a “good judge” of teacher, but there are much deeper issues with using test scores as a part of evaluation, such as the fact that more 70 percent of courses in a high school do not have these state tests. Teachers that I know aren’t trying to avoid being evaluated as you suggest; they simply want those evaluations to be fair and just, as any employee in any line of work would want. Now, let’s take a look at the evaluation system you suggest. You provide several interesting sources of evidence for teacher evaluations. First of all, you would base 10% of the evaluation on “what students thought of the teacher.” I hope you aren’t suggesting that students rate the teacher as a person. I suspect you are really suggesting that students are somehow surveyed on what kind of job they think their teachers are doing. This is reasonable in some ways, and I’ll agree with you. But there obviously has to be careful attention paid to the survey instrument so that its questions get at the heart of instructional prowess and not opinions about the teacher personally. The question then becomes, what do students know about a teacher’s instructional ability? The answer to that question could be used as a basis for survey questions. Our school has used student surveys for over 5 years, and one quite common problem is that the responses can sometimes be about anything other than the teaching. The data is useful, however, because it can help us make changes where there are genuine complaints and issues. The second source of evidence for teacher evaluation you suggest is “what the parents think of their teachers.” Again, that seems reasonable, if what you are suggesting is a parent survey that focuses on a teacher’s ability to teach. For obvious reasons, the survey would need to move beyond asking the parent what they thought of the teacher as an instructor. But there are some issues that would need to be ironed out. For example, one issue that would need to be dealt with would be the fact that few parents witness the actual teaching teachers do in the classroom. They get most of their information about what happens in the classroom secondhand. I can tell you as an administrator that quite often that secondhand information isn’t entirely accurate. A student often goes home and tells a parent one story about something that’s happened in their classroom or to them or what a teacher has done. That parent next calls the principal, clearly angry, until they hear what really happened. Using parent opinions about teacher practice would be especially difficult since they do not witness teaching in action; they have to rely on hearsay, which as we know is unacceptable in court rooms. Parent surveys could focus, however, on the parts of teaching that they do directly witness, such as teacher to home communication. At any rate, if parent surveys were to be used in teacher evaluations, they would need to be much more than simply asking a parent what they thought of his or her teacher. The third source of evidence you suggest for teacher evaluations are test scores. That also seems reasonable until you try to implement that practice which we’ve done in North Carolina. The issues are many. Some of the tests are inferior and are of questionable quality. Then there’s the fact that not all subjects are tested, which leads to questions like: Do you evaluate only those in tested areas, or do you develop and administer tests in every single subject area, which is quite costly in terms of time and money? In addition, some tests were designed in a way that they make poor choices for use in evaluating teachers. Tests like ACT and SAT were created for an entirely different purpose rather than measuring teacher quality. Additionally, tests designed for assessing student achievement have never been proved valid for assessing teacher quality. Other issues with test scores used as part of teacher evaluations? How do you separate the effects of previous years teachers on this year’s teacher scores? The list of issues with using tests as evidence of teacher effectiveness is lengthy, that’s why teachers and myself question the practice. A test is a test is a test is how much of the world sees it, but most of us who’ve been in education know tests aren’t as simple as we wish they were. The fourth source of evidence for teacher evaluations that you suggest are “peer scores” which I suspect you actually mean peer ratings. Peer ratings seem to make sense too, after all, who would know better than a teacher’s peers whether or not they are effectively teaching. But the problem with this one is similar to the parent one: there are few teachers who actually know how effectively a teacher is teaching, unless of course you set up a system by which they peer observe. That would work, but it offers logistical problems such as finding time and means for each teacher to observe each other in action. Currently, we use peer observations in evaluations as a part of our process so your suggestion isn’t far from current reality. There is one additional issue with peer ratings too; teachers are often very reluctant to honestly rate their peers because quite often, they have to work with these individuals, and they are often their friends. You have to be pretty naive about human nature to see peer ratings working very well. The fifth source of evidence for teacher evaluations you suggest are “self scores” which I would suspect you mean self ratings. Believe it or not, we already ask our teachers to do “self-assessments.” While these aren’t directly connecting to a teacher’s final rating, they are used as a part of the evaluation process early in the year. Teachers use them to honestly look at how they stand with our teacher evaluation, and many use it as a basis for their professional development plan. Of course it’s like any self-assessment; it’s only as useful as the amount of honestly employed in its completion. The main problem with self-ratings is if high stakes are tied to it in any way, how noble do you think someone would be to give themselves a poor rating if it could impact their job status? Your final source of evidence for teacher evaluations you suggest are “principal scores” which I take to mean principal ratings. In North Carolina, this is practice. Principals complete a summative evaluation of ratings on teachers at the conclusion of every year. This is in turn used to suggest professional development for the next year. Principal ratings are certainly not without issues as well. Most of us have worked for bosses who were tyrants and completely incapable of making fair and partial judgments. Because of this danger alone, principal ratings have issues too. I would say “Engaged Parent” you do get one principle right in your evaluation suggestion; we do need multiple sources of evidence for teacher evaluations. The issue is simply deciding which ones will effectively improve instruction for our students. We do need multiple sources of evidence to evaluate teachers, but if we choose the incorrect evidence, then our teachers don’t teach well and what we set out to do which was improve student learning never happens. We can’t afford to get teacher evaluation wrong because in the end our children will suffer. So, “Engaged Parent” we do have evaluations of teachers. We also use much of the evidence you suggest above, and there’s talk of adding other sources as well. Teachers as a rule in North Carolina do not complain about being evaluated. Like any employee they do complain about evaluated unfairly, and that is a great deal of the criticism you’re hearing. I would suggest that since you have a great interest in teacher evaluations, you might want to read a book called Evaluating America’s Teachers Mission Possible? by W. James Popham. Popham goes to great length to argue what a good, fair and valid teacher evaluation would look like. He even goes through about every single source of evidence you suggest and points out the problems with them and suggests how those problems might be alleviated. It’s a good read for anyone, educator or non-educator, looking into the evaluation of teachers. How we handle the details of designing our “learning spaces” ultimately determines what happens in our classrooms. As Jukes points out, for the first time in history students and teachers do not even have to be in the same place when learning. Also, the content is no longer confined to textbooks. Still, our schools’ classrooms are designed for “imparting knowledge” not engaging in authentic learning. I would bet if you look at any recent plan drawn up for a new school, the spaces are still designed for traditional factory model learning. The classrooms are arranged like so many pods with desks sitting in rows with a teacher desk placed at the front of the room with a whiteboard located behind. What many still do not quite understand is a simple principle of classroom design: How you plan the learning space ultimately determines the kinds of learning that happens in that space. Even the furniture selections can impact the learning that happens. Take the student desk as an example (like the illustration above). These desks are still everywhere in our schools. When new schools are built, hundreds of these are ordered and then placed in neat rows in classrooms. But this particular desk is problematic if we are looking to create learning spaces where students collaborate and engage in active learning. These desks are designed to be placed in rows and to actually restrict the movement of the student sitting in it. Have you ever complained about how hard it is to move and get out of these things? But in a factory era school, student movement is discouraged and what better way to do it than by designing a desk that minimizes the movement of students? These desks are perhaps a symbol of what’s amiss about so-called 21st century education today. We still think of learning spaces as ways to control students rather than ways to engage them in real learning. I have no way of knowing whether those who designed the first student desks in this manner really had the goal of making a desk that restricted movement, but the fact that so many of these still exist in our classrooms is symptomatic of a greater problem: We just can’t let go of the idea that schools are factories whose job is to churn out students who have been declared educated through testing and credentialing. “Get’em through the system like widgets and declare them graduated and educated if they make through the hurdles and tests.” In our classroom learning spaces we still buy furniture whose purposes is to control and attempt to make learning fit into neat orderly boxes, when those of us who’ve been teachers for some time know real learning is messy and not always subject to the controls we place on it. We keep arranging our schools’ classrooms for teacher-directed instruction instead of designing them for student-directed and inquiry learning which we know is how most of our students want to learn. In a word, for all our talk, we are trying to fit 21st century learning into classrooms designed for factory-model education systems. Obviously, my point is obviously not to get you to throw out all the student desks in your buildings. But, the question is, how can we re-envision our learning spaces to make authentic, engaging learning happen for our students? We can begin by looking at our current classrooms and see how we can transform them from places to control to places to explore and engage learning. This doesn’t really cost us very much either. 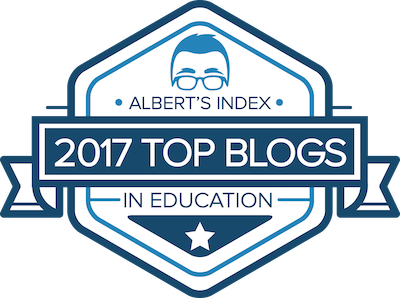 I don’t usually post a video on its own my my blog, but W. James Popham’s irreverent look at the teacher evaluation reforms going in the United States simply speaks for itself. His mock info-mercial here is almost believable in the climate of Race to the Top and the NCLB waivers. How many times have you heard the advice that until you love yourself you are incapable of loving others? We as educators live in a field that talks a great deal about “putting students first” and “sacrificing for the benefit of the kids.” What this translates to in daily practice is long hours, substantial amounts of time grading papers outside of class, and spending personal money taking care of the students. These are all noble actions. By far, the expectations that most every educator I know is that they literally “would give the shirt off their back" to a student if it would better that child’s life. They are, as a profession, despite much of the reform rhetoric, a dedicated group of people who genuinely care for the children in their charge. For all their altruistic motives though, educators are just as prone to neglect their mental, spiritual, intellectual, and physical health in this exercise in self-sacrifice. They often literally give these up on the altar of sacrifice, resulting in the usual mental, spiritual, and physical problems. Mentally, this time of the year many are burnt out and struggling through the anxieties and pressures of ending another year. Spiritually, they’ve often neglected to engage in reflection and contemplation in their chosen religion, or non-religion, resulting in a sense of lost significance and purpose in life. Intellectually, educators haven’t taken the time to foster curiosity and intellectual exercise so vital to having the momentum of being life-long learners. Physically, educators struggle with their weight, high-blood pressure, cholesterol, and fatigue. In short, educators have neglected the four areas that matter most to their overall well-being and happiness: mental well-being, spiritual well-being, intellectual well-being, and physical well-being. Recently, I was forced to go to my doctor due to a dull chest pain that seemed to be persistent. To make the story short, I found myself connected to an EKG machine for the first time of my life of 51 years, and upon my exit from his office, armed with a prescription for cholesterol medicine. I have prided myself in not having to take any medications up to this point, and now I was going to have to take it each day. The combination of these occurrences were not powerful enough to be epiphanies, but they were eye openers. I realized I was neglecting myself into having more and more health problems. Something had to change. Since that event, I did some inventory. Honestly, I had done well in the area of mental and spiritual well-being recently. For me, both of these were being satisfied with my ongoing Buddhist meditation and mindfulness training. Mentally, I was dealing much better with job stresses, with just an occasional relapse. Spiritually, I continued to explore my own religion through daily mediation practice and one spiritual retreat every year. Things have felt good spiritually. Intellectually, I also felt engaged and alive. With all the books I’ve lined up for reading, and my ongoing professional learning through my PLN added to my pursuit of a doctorate degree, I felt intellectually satisfied as well. Physically, all was not well though. I was tired much of the time. My cholesterol was deadly while my diet was making me miserable every day. My stomach was constantly in pain or irritated. Overall I physically did not feel well. So, I focused on two things I knew would definitely help: diet and exercise. I have been thinking about changing over to an all vegetarian diet for some time, and this health check gave me the motivation I needed to make a diet change. I vowed to eat vegetarian, and I have been doing so for three weeks now. I have eaten more fruits and vegetables. For exercise, I simply decided to take a brisk walk of about 4 miles per day. In the interim three weeks, I have never felt better. I have more energy than ever, and I am able to focus for longer periods of time. Additionally, I have dropped 14 pounds in the process. I also no longer have the indigestion and stomach ailments I once complained about. The combination of diet and exercise, combined with my continued spiritual practices, intellectual pursuits have made me feel much more sharp and alive in my job as a school administrator. I once had a college professor who always ask the question so what when any of us in the class made a contribution to the discussion, so I think that question is appropriate here: so what? What does that have to do with school leadership and being an educator. Simply put: as school leaders and educators we need to love ourselves just a bit more. Loving ourselves doesn’t mean we’re being selfish; it means we are actually loving our students by loving ourselves, taking care of ourselves. For example, a school administrator taking an hour or so in the afternoon for a brisk walk isn’t being self-indulgent; he’s demonstrating love for self. Taking time to engage in the spiritual or non-spiritual practice of your choice is also not self-indulgence. It also is loving self. Making decisions and being mindful about what you eat is also about loving self. It is so obvious we sometimes don’t see it: we can’t keep neglecting ourselves and expect to be able to do what’s best for kids for any length of time. Our students need living, capable and compassionate teachers and principals, not martyrs. While I have only made some of these changes three weeks, I am confident that they will last because of the rewards of feeling much more energetic and alive. As this year ends, and you begin the process of reflecting on the year and thinking of the coming year, perhaps you need to make sure all your bases: mental well-being, spiritual well-being, intellectual well-being, and physical well-being are a priority. It’s so well known it’s a cliche, but you can only begin taking care of others when you have taken care of yourself. I’ve been pondering for some time about making a switch to a Mac laptop. I’ve been a Windows user all the way back to 3.1 and DOS. There was a time when I adamantly defended PC’s, but in recent years, I’ve found Apple products much more satisfying. I started out with an Android tablet, which proved to be satisfying in some ways, but when the device repeatedly failed to update resulting in countless phone calls to cell phone providers and device tech support, I had enough. I’ve been using iPads since the First Generation and have always been pleased with the reliability of those devices. Besides an app crashing on occasion, which was usually due to the app maker and not the device, I have grown to treasure my iPad and iPad mini. This weekend I purchased my first Mac in the form of a MacBook Pro, and besides learning about some of the unique ways of navigating through software, installation of software, I’ve successfully made the transition. I hope to be sharing some of the apps I’ve quickly come to know. The model of MacBook Pro I selected was the 13 inch screen with a 2.4 GHz Intel Core i5 processor. It has the built-in Retina Display which has so far amazed me with its resolution and graphics. It also has the flash storage and 4 GB of memory. All in all a pleasant experience since I removed it from its packaging. One thing I will say regarding the Apple set-up experience compared to the Windows PC experience, and I’ve set up many PC’s, is setting up this MacBook Pro was much, much simpler. It appears Apple still takes the user experience seriously, because I’ve never had a computer set up run more smoothly. There is one major issue I am struggling with my Mac transition. There are several Windows programs that were my favorites, and these aren’t available in Mac versions. For example, KeePass password safe was one of my personal favorites. It isn’t available in a comparable Mac version. There are a few similar password options but nothing like I’m used to. Also, I had the simplest Checkbook management program available on my Windows PC, but that software also does not have a Mac version. I did end up finding a comparable Mac version, but again, not exactly what I had. Then there was my need to purchase Microsoft Office’s Word, Powerpoint and Excel. I pondered whether I needed to purchase these, then I found out my Endnote program I am using for my dissertation work requires it in the Mac version, so I had no choice. The bottom line from this former PC user is; I’ve made the right choice for me. I just wasn’t fond of Windows 8 and did not see myself ever making that upgrade. I really don’t need my laptop to have a touch screen. I’ve converted to Mac and I am glad to have done so. Perhaps some of you experienced Mac users can suggest other apps I need to get. Looking through the week's stats, here's what everyone seems to be reading this week. Apparently, quite a few fellow web browsers have found themselves annoyed by those infernal auto-playing audio and video ads that play while accessing web sites. This post provides instructions on how to stop those ads from playing. Post on the importance of leaders remembering that their views are simply that. Leaders don't necessarily have the "truth." 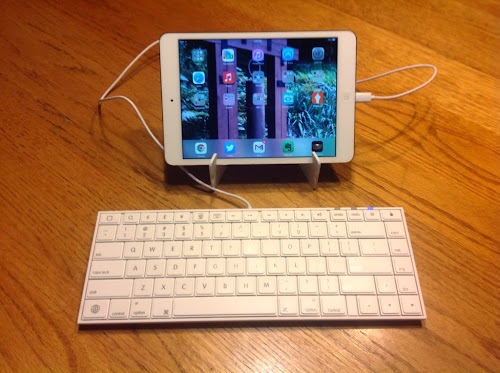 The Macally iKetLT is a much less expensive keyboard that connects to your iOS device through a Thunderbolt connection. 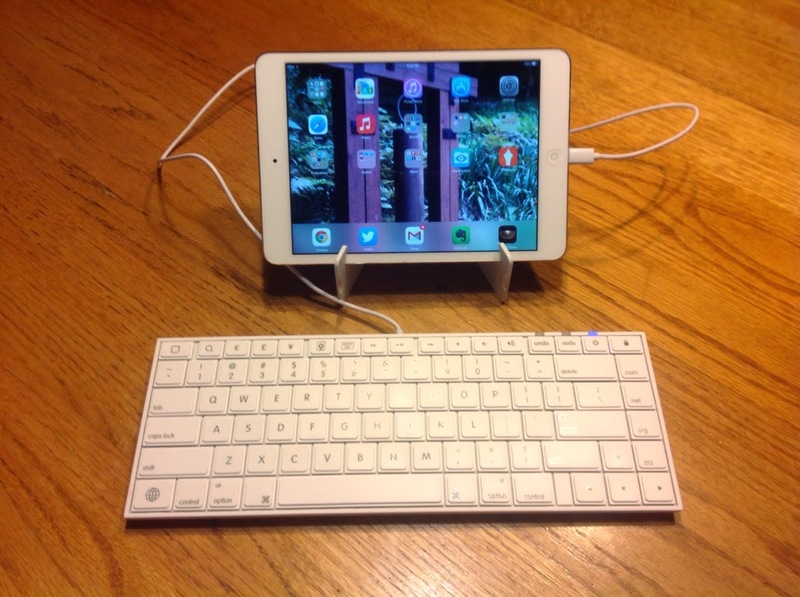 It works very well with both your iPad or iPhone. This is my review of that device. My review of Evernote's latest feature added to the desktop app for premium users. You can turn your notes into a presentation. My post on why merit pay schemes are a waste of time and resources and why it will never work in education. Can Non-Teaching Administrators Effectively Evaluate Teachers? The arguments about whether school administrators who haven't been classroom teachers can effectively evaluate teachers is never-ending. At the heart of that argument is actually whether teaching is a professional skill requiring great expertise, or whether, as some business-minded people seem to think, it's a skill that anyone can do, with as little training as possible. But can an administrator who has never faced the day-to-day management of a classroom full of students adequately pass judgment on the quality of a teacher? I would say probably not. Before the barrage of emails start, let me clarify my reasoning for using the word "probably." To teachers who think I should have used the words "definitely not" instead of "probably not," let me say that I don't think there are absolutes here. There are certainly administrators out there who have enough intuitive understanding of what "good teaching" looks like that they might be able to do an adequate job of evaluating teachers. But, and this is important, I think that is by far the exception. In the United States, there is a prevalent belief that somehow a successful businessman is capable of "super-heroic" feats and should be respected as capable of doing anything---from being a great leader to a politician. This is evident in how many times political advertisements display proudly the title "Successful Businessman" as if that somehow automatically qualifies them for office. As an offshoot of this belief is the idea that a person who's managed a thousand-plus employee corporation can somehow step into a school and manage it just as well. The same thinking seems to apply to those who are military leaders. They also are somehow revered by some and seen as fully capable of managing schools and districts simply due to their established leadership abilities, and this includes the evaluation of educators. But I submit to you that neither business leaders nor military leaders are always capable of managing educational organizations. They are definitely not always capable of judging the effectiveness of classroom teachers simply because when they do judge teaching, they automatically see teaching as a simple task of "imparting knowledge" to students and not a complex set of experiences and activity that are designed to make the deeper learning of critical thinking, problem-solving, creativity, etc. possible. Sure, these business leaders quite often are creative and experienced people when it comes to solving problems. But their experiences lie within organizations where employees are easily dispensed with, and if products are defective, they can be simply discarded. In the educational enterprise, we can't dispense with students when they are somehow not measuring up like so man defective parts; we have to teach them from where they are. Also, while we could easily fire teachers not quite measuring up, we then have to face the issue of trying to find another teacher in a climate of fewer teachers and fewer young people becoming teachers. In fact, most teachers, and I would add principals, don't fall into the black and white categories of "good" and "bad." Most fall in the middle where evaluation is incapable to making those extreme categorizations. Instead, good administrators are often in positions of working with all teachers to move and improve to the "good" category. Classrooms are very complex places. After having spent 16 years of my 25 years in them, every single time I enter one to evaluate a teacher, I always remember that. It does not translate into a sympathetic lack of will to honestly complete the evaluation; it simply means I view classroom teaching through a lens of complexity that allows me to see many more of the subtle things that happen as a teacher engages students. It took time for me to develop that lens. I think it fair to say, that lens allows me to better understand teaching and learning, and it makes me a better evaluator. Often, when an administrator has never been in the classroom lacks having this lens, he must resort to the only lens he has, which is often tinted with a superficial understanding of teaching and learning. That means he grasps for simple evidences of good teaching like test scores, attendance, and graduation rates, which are numerical in nature and easily placed on a yardstick. He doesn't see teaching through a lens of complexity and understanding. It is for that reason, I would say that administrators who have taught for a period of time themselves understand "good teaching" better. Those at the extremes of good teacher and bad teacher are certainly easier to recognize, so the non-teaching administrator could easily recognize their expertise or lack of skill. It's all those in the middle that need the coaching and support that escape the black and white categorization of a superficial understanding of teaching and learning. A non-teaching administrator is often simply incapable of seeing the complexity of teaching. Merit pay is one of those ideas in education that just won't die. When budgets get tight, policymakers and politicians both look at the money being spent on educator salaries and the idea of paying educators based on performance starts looking attractive. "If only we identify the best teachers and pay them more, all will be well," they think. Then, the task of trying to identify and operationalize what a "best teacher" looks like begins, and it immediately falls apart. There's never been any agreement on what characterizes a "good teacher," and there probably never will. The current reform and accountability craze would have us believe "test scores a good teacher makes," but those of us who've been in classrooms for sometime know that tests don't always tell us what a good student is much less a good teacher. The pursuit of trying to find a specific, clear definition of good teaching and a good teacher is impossible, because teaching and learning, for that matter, are way too complex to reduce to a simple operationalized definition. As Kohn points out, the problem with merit pay is that it is manipulative. It is simply an attempt to control educators and elicit a behavior, and in most cases, the desired behavior is the production of higher test scores. The problem is, many of us educators know "getting higher test scores" is a superficial goal. Getting a high score on a North Carolina Final Exam or End of Grade Test means very little in the lives of our students. We can't say to our students, for example, "If you get a high grade on this reading End of Grade Test, you'll be successful in life." If we do say that, we're trivializing education. So the idea of manipulating teachers to get them to raise test scores by merit pay is doomed to fail for those of us who see education's purpose as more universal and global. Educating good bubble-sheet bubblers is quite different than educating solid citizens who can take their place in the world and perhaps change things for the better. In the end, merit pay will always fail in education, because the enterprise in which we engage is much too complex to be subject to its manipulative effects. Merit pay has been tried and it failed every time. Unfortunately, those who still have the faith in manipulation by reward just can't seem to let go of an anachronistic view of human motivation. Leaders are sometimes very stubborn people. They make mistakes, but then they spend an inordinate amount of time trying to conceal those mistakes. To some school leaders, showing that you are capable of making mistakes is revealing weakness. But, if you want to foster a culture of creativity and exploration in your school or district, you have to embrace your mistakes and display them. We display them by being open with candor with those we lead. By that very action, we demonstrate that trying and failing isn't the "unpardonable sin." As authentic leaders we must strive to make our mistakes public. We admit them; we learn from them. Creativity thrives within a culture that embraces failure as a product of experimentation. A few years ago, when teaching my students writing, I emphasized repeatedly to them, that writing is about experimenting. It is about trying new combinations of words and ideas. I told them that means sometimes we write "drivel" and sometimes we pen words that inspire. But then I told them that "drivel" is a necesary part of writing. Just the same, mistakes are a part of leadership, and the wise leaders make them public. Authentic leaders that strive for creativity accept, acknowledge, and use failure, not hide it. We should always strive to make our mistakes public to those we lead. By doing so, we make it safe for others to be creative. Do you want your staff to approach problems and come up with creative solutions? Then perhaps you need to celebrate mistakes and failure through disclosure to make it safe. Sometimes one of the hardest things for me to accept as a school leader is recognizing that no matter what I think, no matter what my opinion is on an issue, that viewpoint is simply "my viewpoint." It isn't the law. It isn't "research-based." It isn't the gospel. It is simply my belief. It simply isn't exactly what it appears to be; it is how the captial "I" or "me" views the situation. I have no monopoly on truth. This means that when I express my views as a leader, I must also humbly acknowledge when what I am saying is simply "my views." In American culture there are no shortages of people who believe that they themselves are imparted with the "truth." Sometimes I find myself lapsing into that frame of mind. But, if I am going to be an authentic educational leader, I must always be mindful that how I see things isn't necessarily how things are. I must humbly accept that I perhaps do not know as much as I thought. The reason our culture is so polarized is because everyone is too busy protecting "their truth" and not listening to each other. Being open to other viewpoints is not a negative. It is a step to being an authentic leader. Macally iKeyLT: Full-size Keyboard for your iPad or iPhone. It is fairly clear that our state legislature still operates under the misconception that there are teacher unions in North Carolina. They also seem to forget that these organizations represent "real teachers" who have concerns. Sadly, I suspect Senator Curtis' feelings and ideas run deep in this North Carolina Legislature. Update: According to this WBTV news posting ("CMS Teacher's Strong Words to Politicians") North Carolina State Senator David Curtis "has no regrets" for what he said. He states that he just wanted to tell his side of the story. A visit to his web site, which hasn't been updated in three years is a fairly good indicator about Mr. Curtis and all he stands for. (See Curtis Davis' Web Site Here.) He is apparently against anyone, especially if you happen to be employed by the government, which he sees as the enemy except perhaps when it helps business. Too bad Curtis is like so many other legislators in this state. Their districts are so gerrymandered that they can run for re-election unopposed. Yesterday, North Carolina Governor McCrory announced his plans to raise teacher pay in the short term with an average 2% raise, he also introduced a plan to raise teacher pay in the long-term. These long term plans were to raise pay based on a combination of experience, education, merit and market-need. The big question is always how do you pay for this when the North Carolina Legislature severely cut revenue last year, and it has been reported recently that there is already a $445 million shortfall? It would appear that our North Carolina Lieutenant Governor Dan Forest has an idea for paying for these teacher pay raises: Let’s pay for them by donation. According to WRAL this morning, Lieutenant Governor Forest is proposing to gather donations from specialized license plates, taxpayer donations, and corporate donations to pay for the new teacher pay raises proposed by McCrory, (See “Forest Proposes Endowment Fund to Raise Teacher Salaries.” ) Instead of finding tax revenue, Forest’s plan is to rely totally on donations for fund teacher pay raises. Forest states that it is a “creative response to tough economic times.” I would grant that it is perhaps a “creative” response and probably one someone who is tax-averse would suggest. Perhaps our entire government’s salaries should be paid by donation? If our Lieutenant Governor or Governor were paid “by donation” too, we could simply stop donating if they aren't doing the job we thought they should be doing. The real problem with Forest’s suggestion is that it might really illustrate that our current state government is still not entirely committing to paying teachers what they deserve. Instead of biting the bullet and finding existing money or new revenue, they are going to resort to essentially what State Senator Josh Stein calls “voluntary taxation.” Methinks Lientenant Forest’s proposal has to be one of the most bizarre ideas yet to come out of this current state government. I give Forest a A for ‘”off-this-planet” thinking, and an F for really being committed to finding ways to pay teachers what they deserve. Expansion of early childhood education by about $3.6 million. Increase textbook funding by $23 million. Increase beginning teacher pay from $30,800 to $35,000 over the next two years. Provide an average 2% pay raise for experienced teachers. Institute a new long-term pay plan for teachers that combines experience, education, merit, mentoring, and market needs. In addition he seeks to offer higher pay to teachers choosing to work in hard-to-staff schools. At this point, it appears that McCrory’s long-term pay plan which he called “Career Pathways for Teachers” looks to be a compromise between the idea of merit pay and traditional ways in which teachers are rewarded. Giving teachers pay raises based on experience and degrees formed the basis of North Carolina’s previous teacher pay scales. What will be perhaps harder to implement is the idea of merit pay, especially if based on test scores. The obvious problems being that not all teachers’ classes are subject to tests, and the fact that current use of value-added and growth scores are being increasingly challenged in the courts. I would also add that the reliability and validity of value-added measures and their use in a high-stakes manner are also disputed as well. Add these concerns with the fact that studies on merit pay tied to student achievement mostly show that such pay schemes do not work any way, and it would seem this part of the pay plan is a waste of time and money. McCrory’s idea to offer higher pay to teachers choosing to teach in hard-to-staff schools is also not surprising. This has been tried as well and with mixed results. McCroy’s idea of letting market conditions determine teacher pay may seem sound to those outside education, but one can only imagine what that measure will do to morale and collaboration in a school. As an educator, I applaud Governor McCrory for listening to educators which it is clear that he has done in some of his proposals. All teachers do deserve pay increases. The past few years have not been kind to North Carolina teachers and teachers nationwide. The real test Governor McCrory faces is whether he can get this plan, or some variation of it, through a legislature that has demonstrated an incredible unwillingness to budge from many of its far right stances. After over a decade, policies relying on high stakes testing as a means to drive more effective teaching specifically and a better education generally have become embedded in public education. Fullan (2014) says we have gotten it all wrong. In his book, The Principal: Three Keys to Maximizing Impact, Fullan points out that these federal initiatives have failed to bring about extensive instructional change because they use the wrong policy drivers to try to change education. In other words, we simply aren’t getting the kinds of change we want in education because we are focusing on the wrong things to make that change happen. What should we be doing to maximize impact on schools? According to Fullan, we need to “reposition the role of the principal as overall instructional leader so that it maximizes the learning of all teachers and in turn all students” (p. 6). To do this, Fullan indicates we need to focus on three key aspects of the principal’s role: 1) Leading Learning, 2) Being a District and Team Player, and 3) Becoming a Change Agent. Beginning in “Chapter One Outmoded,” Fullan describes both the current problem in education, and he introduces the idea of reconceptualizing the role of principal. According to Fullan, the current problem in education is that the “conditions for mutual learning have been seriously eroding” (p. 5). Students are increasingly bored and disengaged from schooling, as indicated by the fact that “schooling alienates two-thirds of kindergarten students by the time they reach ninth grade” (p. 5). Teacher satisfaction in their work continues to decline (p. 5). Even the job satisfaction of principals, who see their jobs as being too complex and too stressful, has been dropping since 2008 from 68% to 59% (p. 5). According to Fullan, this problem in education is due to an improper conceptualization of the role of the principal that is confusing and actually inhibits the professional learning of teachers and in turn the learning of students (p. 6). In chapter two of the book, Fullan focuses on what he terms the “Four Wrong Choices for Driving Policy.” The four “Wrong Choices for Driving Policy” are: accountability, individualistic solutions, technology, and fragmented strategies” (p. 22). Each of these choices, according to Fullan, is more a part of the problem, than a solution. For example, one of these wrong policy drivers includes current accountability strategies, which involve the belief that by tightening accountability through standards, standardized testing, and tying performance to test scores, student performance will improve. The problem with this approach to forcing educational change, according to Fullan, is that it assumes professional capacity is already there, which is not always the case (p. 27). Teachers and principals may lack the expertise to bring about learning gains with the students they have or the environment in which they’re teaching. According to Fullan, Principals in schools driven by these accountability policies are forced to simply “get better at a bad game” where you do what you can “to please the higher-ups in order to protect your staff and yourself” (p. 28). Fullan takes readers through each of these “wrong drivers” and explains exactly how that are negatively impacting education and actually keeping educators from getting the results they seek and preventing principals from leading schools the way they should. If these “wrong drivers” of policy aren’t working, what exactly is Fullan’s solution? In Chapter Three, he begins describing what he calls the “The First Key for Maximixing Impact” which is the first of his three solutions for principals. The first key is “Leading Learning.” In a nutshell, Fullan describes how principals can focus on building the professional capacity of the whole teaching staff rather than focusing on individual teachers. As he points out, principals should spend their time developing the group, not focusing on individual teachers because that is where the greatest learning gains for all will occur. Principals need to lead the professional learning of the teachers in a school as a group. They do this by leading “the school’s teachers learning how to improve their teaching while learning alongside them about what works and what doesn’t” (p. 55). According to Fullan, Principals should focus on capacity, climate, community, and instruction to maximize the learning in the school. In chapter four, Fullan describes his second key for maximizing impact which is “Being a District and System Player.” He describes how principals need to do such things as “looking without to improve,” “foster intradistrict development,” “create district coherence,” and “reaching out beyond the district for expertise” (p. 97). When “looking without to improve,” principals need to foster network connections outside the school but within the district to access new ideas and practices. When “fostering intradistrict development,” principals need to connect teachers in order to exchange ideas across the district. When “creating district coherence,” principals work together under the guidance of the whole district to improve all the schools. Finally, when “reaching out beyond the district for expertise,” principals connect to external sources, outside the district, for innovative ideas. In each of these instances, Fullan suggests that principals can maximize their impact on their schools by engaging the system in building professional capacity of teachers. 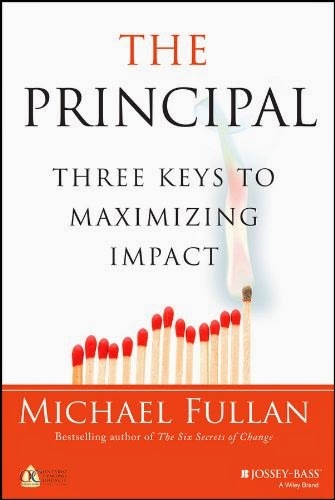 In chapter five, Fullan describes his third and final key for principals to maximize impact on their schools. This key is “Becoming a Change Agent” (p. 123). Fullan argues that principals must focus on building their own professional capacity of becoming a change agent by fostering seven professional capacities for making change happen, which he describes in detail. For example, capacity one is “Challenging the Status Quo” which involves such things as questioning common practices, taking risks, exploring innovations, and avoiding letting the rules slow down the action” (p. 129). Fullan argues that principals need to foster their own capacity of challenging the status quo in their efforts to become a change agent. The rest of chapter five is devoted to describing these professional capacities for becoming a change agent in order to maximize impact on schools. Fullan’s final chapter offers a glimpse of what the future holds for principals as they face the unpredictable world of ambiguity that education has become. 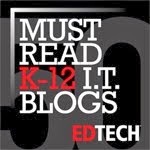 He offers some parting advice for principals on how to maximize their impact on schools by focusing on the digital revolution and what it’s doing to schools and the Common Core Standards and how they affecte the role of principals who want to have the greatest impact on their schools. Fullan’s book The Principal: Three Keys to Maximizing Impact offers principals and district administrators a full view of how current education policy is failing to bring about the results desired, and he offers a research-based approach using three key strategies to maximize impact. Each of the strategies taps into current educational leadership research and provides school leaders a “practical guide” to implement change. Fullan’s book powerfully provokes thought for school leaders on how the principal can best impact learning in her school. As states and school districts begin to wade deeper into using value-added measures, or VAMs, in high-stakes employment decisions, lawsuits are inevitable. On Wednesday, seven Houston Independent School District teachers and their union filed a lawsuit against the Houston Independent School District (HISD), (See "Seven Teachers and Their Union Are Suing HISD to End Evaluations Tied to Students' Test Scores.") In this case, the teachers and their unions are focusing on the fact that teacher value-added ratings fluctuated immensely from year to year. For example, one of the plaintiffs, Andy Dewey, a social studies teacher, received high ratings in 2012, enough for him to receive a bonus. His results the next year dropped significantly. The lawsuit, which you can read for yourself here (HISD Lawsuit), states, "Mr. Dewey went from being deemed one of the highest performing teachers in HISD to one making 'no detectable difference' for his students." If, as VAM supporters hold to be true, teachers have substantial effect on student scores, how can a teacher get it perfectly correct one year, and get it all wrong the next? Increased amounts of time devoted to teaching to the test and test prep activities. Administrative decisions made to drop non-tested subjects like art and social studies. Decreases in morale among teachers and administrators. Administrative decisions to cut time spent in untested subjects to focus on tested subjects. Narrowing of the curriculum to only what gets tested. Teaching becomes more didactic and teacher-centered rather than student-centered or 21st century oriented. Increased levels of frustration for students as they are subjected to more and more standardized tests. Teaching shifts to focusing more on "bubble" students or "money" students as I have heard them called. These are the students that have been identified to have the most potential for the greatest amount of growth. The other students receive less instruction and teacher attention as a result. Increased student apathy and boredom as a result of the disconnect between content relevancy and what's tested. Teachers and administrators shop for students and classes in order to teach students who are more likely to provide them with desired academic growth and test scores. Teachers are leaving a profession where they once believed in teaching students content worthwhile, which is rapidly becoming more focused on the raising of test scores. Potential teachers are choosing to not become teachers because it is no longer about teaching content they care about; it has become more about playing the game to get high test scores. In some schools and districts, teaching has become programmed and scripted and not creative, engaging and self-fulfilling any more. Administrators and teachers are held accountable for test scores in an environment where there are so many things not under their control, such as budgets, which violates the Cardinal Rule of Accountability, which states "Hold people accountable for what they control." The use of high-stakes testing and VAMs are impacting schools and classrooms, but the costs and negative consequences are high. This lawsuit, while it is indicative of some serious methodological concerns about value-added measure, it is also a symptom of a greater issue. Those who still support high-stakes accountability and the use of VAM ignore or minimize any objections to their use. The massive increase in testing and its use for high-stakes personnel decisions under federal and state policy is negatively impacting our schools, classrooms, students, teachers, and our parents. The question becomes, at what point are policymakers going to realize the damage being done to public education? All this focus on standardized testing is making public education a bizarre world where schools serve soft drinks to students as a test preparation strategy (See "Florida School Stops Giving Students Caffeinated Soda Before Standardized Tests"), and where entire schools hold pep rallies in their gymnasiums to get students "pumped up" for latest tests. Where time-honored subjects have become worthless and what's most trivial and "testable" gets emphasized. Where teachers are forced to focus on "money" students at the expense of other students who have needs too. Does not anyone else see anything morally wrong with this entire picture? To me, it is certainly understandable that when "the test results" are what determines job effectiveness, any educator is understandably going to do what is necessary to increase the measure by which their effectiveness is judged. Still, there are moral boundaries we should be unwilling to cross and ethical principles we just can't violate. Raising test scores is not our highest calling as educators despite what the Measure and Punish crowd think, and "Raising them at any cost" is morally repugnant and gives these tests more dignity and importance than they deserve.